Today is another special birthday for me. My hilarious, fiercely loving, and all around awesome sister celebrates her big day today. She’s my only sister. She’s my best friend. She’s maybe the only one in our family that is crazier than me. Which I appreciate. Greatly. In fact, when I was talking to her middle kiddo one time this summer, I said to her “wow, your Mom sure is crazy”, and she looks at me with all the seriousness of a 5 year old and says, “oh, yeah. She’s the craziest one in this whole house”. I couldn’t have said it better myself. But with the crazy, comes the awesome. She is an incredible aunt to my kiddos, and the rest of her nieces and nephews – always thinking of special games, songs, treats, even dances that will make their day. Where she goes, the party will follow. Speaking of parties, she throws a killer one. Last Wednesday, my niece and nephew both turned 6. Twins? Nope, just first cousins that happened to be born on the same day. In the same hospital. By the same doctor. About 8 hours apart. Confused yet? They are even in Kindergarten at the same school. I know. The twin cousins. Could they get any cuter? 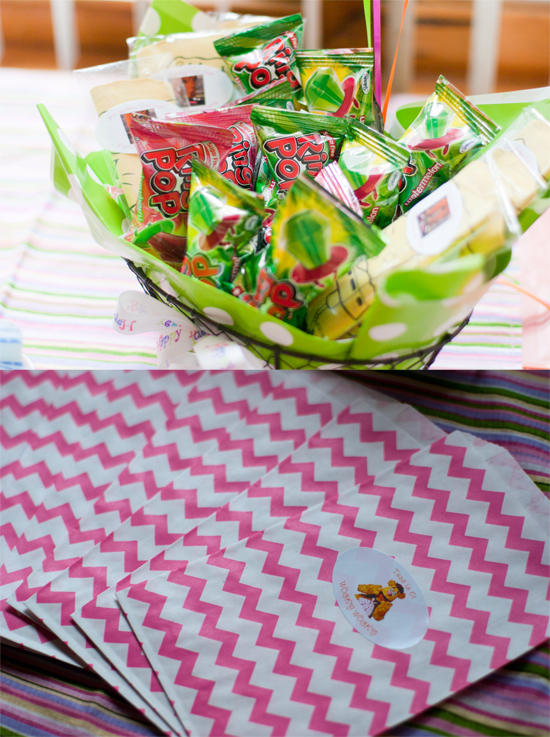 Well, my sister-in-law threw an awesome Angry Birds party for my nephew at a local Gymnastics center, and in my ziel to arrive ontime (which I can never, ever usually manage, but did this time) I am ashamed to say that I forgot my camera. Needless to say, due to this, and my lack luster camera phone (no iPhone…yet), there isn’t much to show here. Trust me, though, it was all kinds of fun. A cookie cake featuring a yellow Angry Bird. Parachute fun with my own two year old getting trapped underneath. Repeatedly. Don’t worry, it was quite intentional. She takes after her aunt in the goofball department. 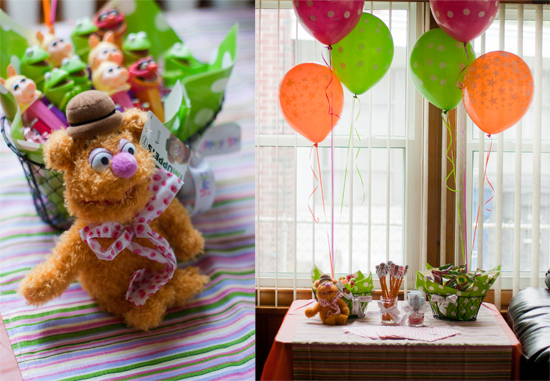 For this same 6th birthday, my niece decided she wanted a Muppet Birthday Party, having fallen quite in love with them on their recent family trip to Disney. 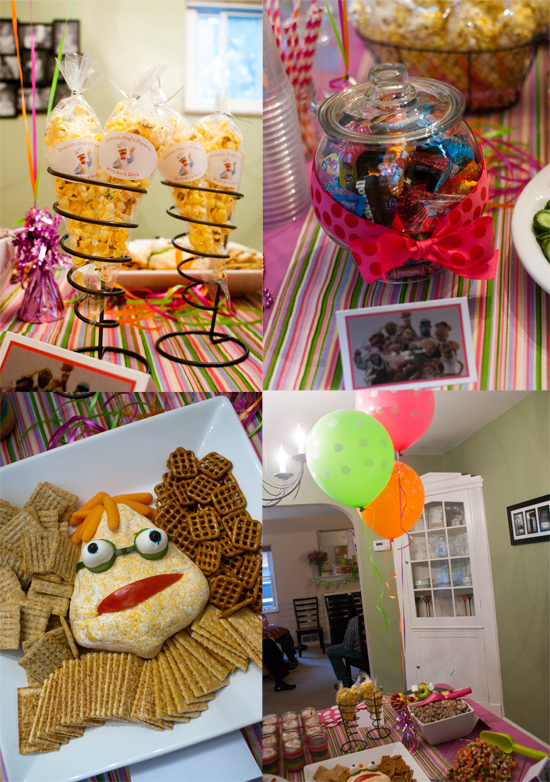 My sister, being the party planner and crafter that she is pulled out every stop and created this incredibly colorful, delicious and wacky party. I loved every second of it! 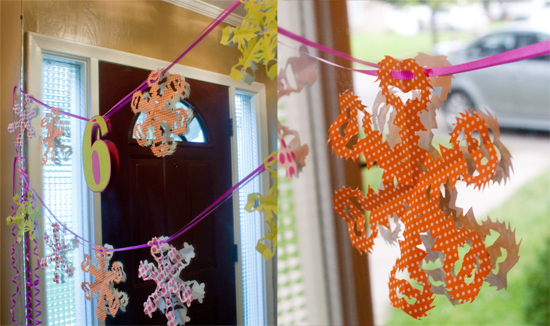 The decorations, food and treat table were all decked out in the brightest colors and cleverest Muppet themed swag. 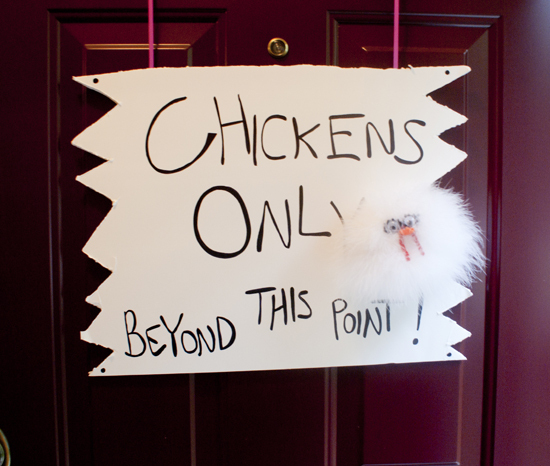 The food was amazing and so hilariously titled (a list of food and inspiration links below). 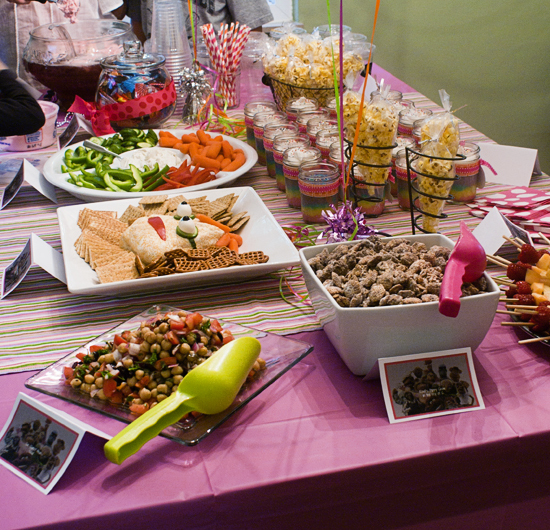 Meatballs, wings, fruit, sweet treats and snacky foods. It was all there, and all addictive. I was seriously close to embarrassing myself with the puppy chow (which my sister made even tastier with the use of Biscoff Spread). I ate a sizeable portion of Skeeter’s chin. 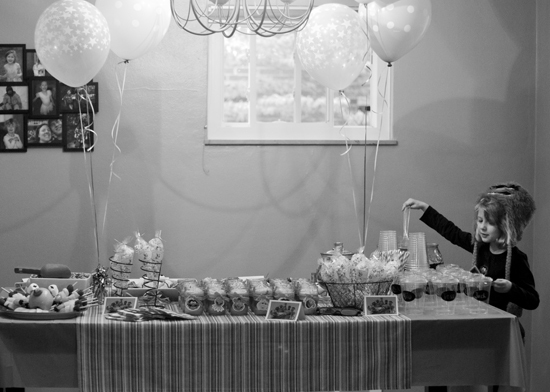 Luckily, I was able to get a few pictures before the mob of hungry party goers descended on the food table. DIY Chalkboard labels! 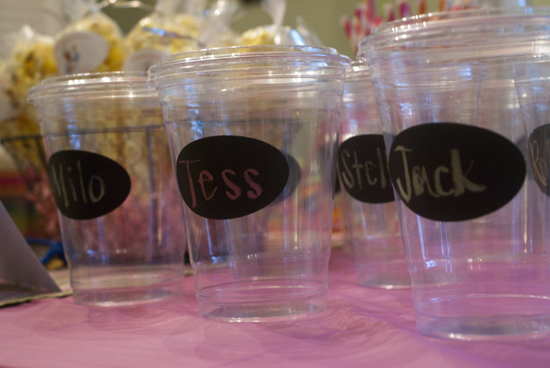 Take regular oval labels, gently rough with sandpaper (if using glossy labels) and spray with chalkboard paint. Genius! 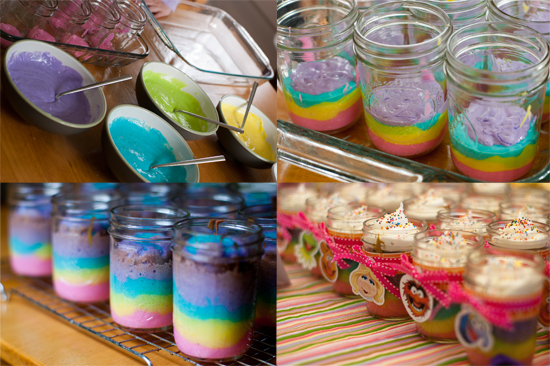 Individual rainbow cakes in jars! These were irresistible, and surprisingly easy to make, too. Just took a bit of time, and a bunch of 1/2 pint Ball jars. Wash and thoroughly dry your jars. Use a white cake mix and mix according to the package directions. Divide the batter into individual bowls (as many as you want to make, we used 5 different colors) and dye each bowl a different color using food coloring. 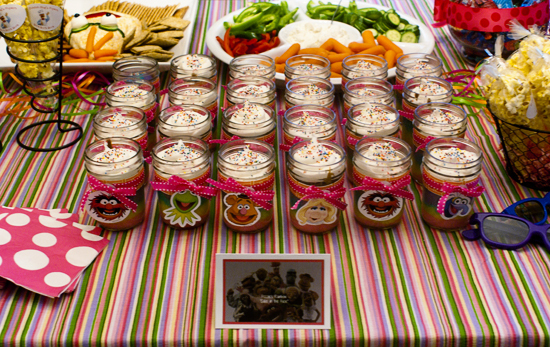 Evenly spoon the different colors into the jars, creating layers. One cake mix box, made 12 cakes, in 12 jars. The batter will come about 1/2 way up the jar (or a little less). This is ideal, because the cake will rise and still leave you room for frosting. Place jars in a 9×13 glass pan, and fill pan with about 1/2 inch of warm water, creating a water bath. Bake the cakes for about 35-40 minutes, or until a toothpick comes out clean. Allow the cakes to cool and decorate them as desired. Voila! 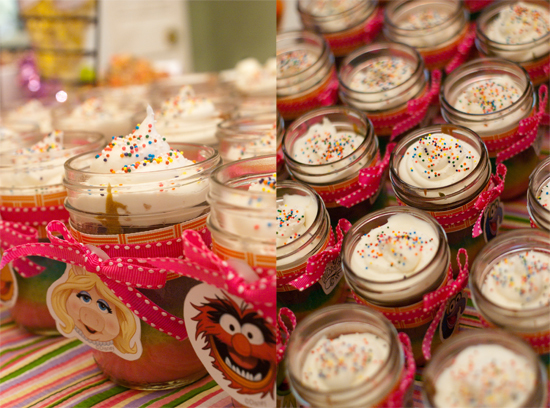 Cakes in jars. 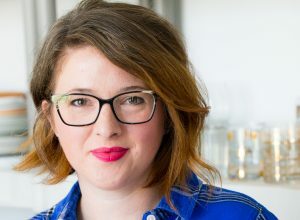 A majority of the food and menu ideas came from Alicia and her awesome blog called ‘Alicia Policia’. 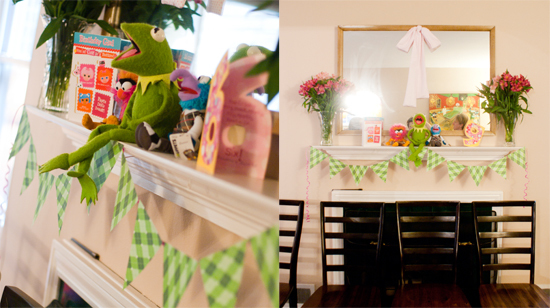 If you haven’t checked her out, she is full of awesome party plans, and these Muppet ideas are no exception. She rocks! All in all, it was a fabulous party, and now we can rest, and plan up for the next one. It seems to come all to quickly. Why can’t they stop growing up? And last, but not least, one more big Happy Birthday to my fabulous sister. Thanks for being you, lady! Didn’t she do a great job? 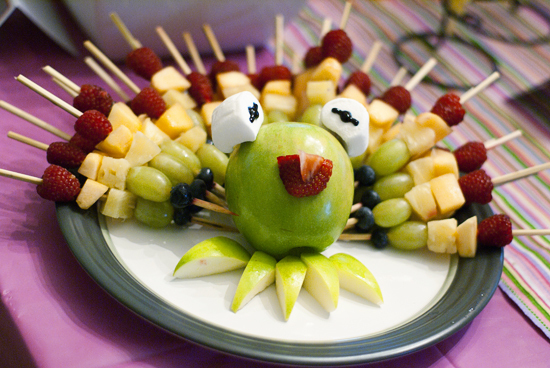 I need to step up my game for my daughter’s Doc McStuffin’s party in October. What did your sister use to make the exploding buns? Hi Jacquie! I actually helped out and made the buns for the party and I used the whole wheat Brioche recipe from the Healthy Bread in Five Minutes a Day cookbook. That recipe is fabulous and I highly recommend it! Thanks so much for stopping by!